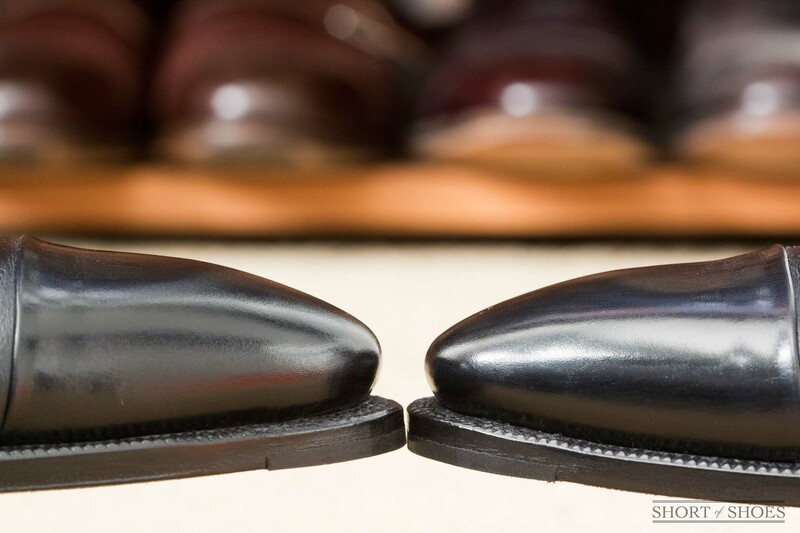 Toe taps are essential for many leather soled dress shoes. There are a few ways to install toe taps on dress shoes, but properly done flush rubber toe taps are the best way to protect the toe of a leather sole from wearing down too quickly. The heels and toes of the sole are the first parts to wear down depending on how one walks. 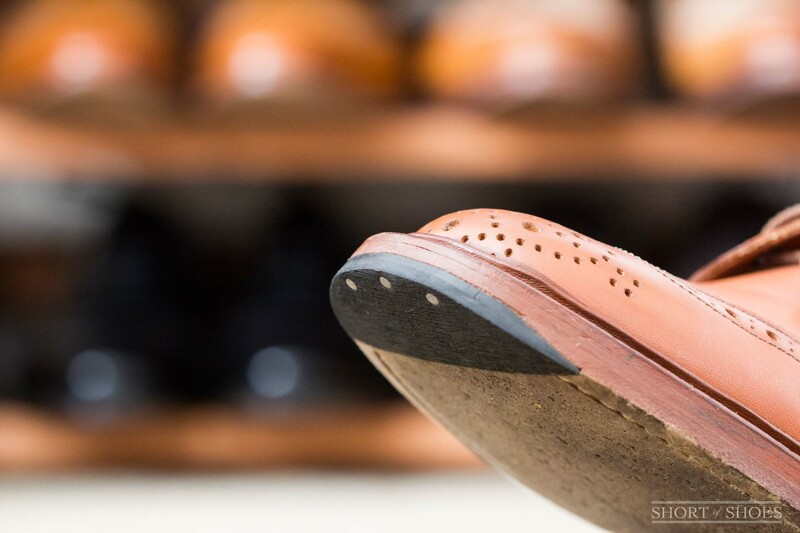 These parts of the sole still wear down regardless if you drag your feet or not, but wear faster or slower depending on your gait. I’ve always made it a habit not to drag my feet since it wears down your soles faster and, in my opinion, makes for an unkempt presentation. 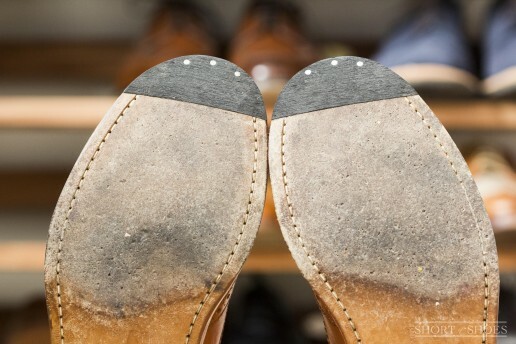 It’s crucial to keep an eye on toe wear because wearing too far through the leather sole and into the welt would make for costly repairs, possibly rendering a shoe unrepairable. Toe worn just slightly into the welt. 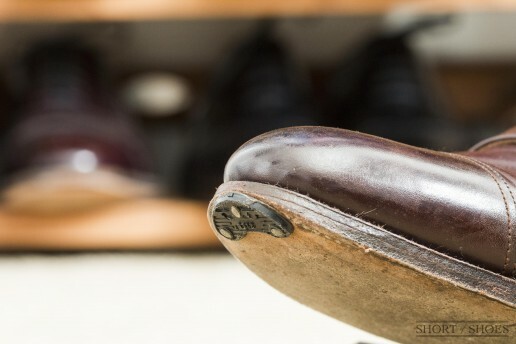 So today we look at the most properly done flush or sunken rubber toe tap, something that is rare for a shoe repair shop or cobbler to do properly these days. But there are many types of toe taps and installation methods so I’ll cover those first, in order from worst to best. The worst type of toe tap for dress shoes protrudes. This is the toe tap you should avoid, even though it's quite cheap at roughly $12. A crescent shaped piece of plastic or metal is simply nailed or screwed on top of the worn toe area. It looks cheap and is aesthetically unpleasing being clearly visible from many angles. 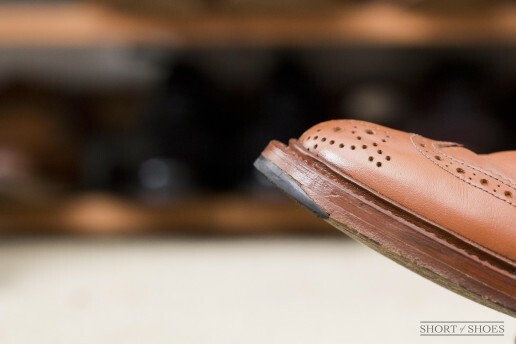 There is typically a small gap between the toe tap and the leather sole in some areas as it’s hard for it to lay completely flat depending on how you wore out the toe. That means all kinds of junk can get in between there, not a pretty sight. This kind of toe tap is something you may or may not feel while walking and it could throw off the balance of the shoe a bit. Simply put, this is the type of toe tap you should avoid. Unfortunately, it's common practice for cobblers here in the US. It serves its purpose, but you can risk damaging the sole stitch, inseam stitching or even the insole if the nails or screws used are too long. These can be replaced a few times, but you’d have to fill in the old holes before driving in new nails or screws through the new tap. For me, I’m not a fan of continually putting holes through the toe where the leather sole isn’t that thick. However, with a double leather sole, these risks are lower. Contrary to popular belief, these kind of toe taps (even metal ones) aren’t noisy when walking. If you install metal taps, they could possibly scratch flooring such as wood or tile, so that's something to keep in mind when choosing the material. See the images below for a gallery of photos for the type of toe tap you should NOT be getting. Just look at it... looks very much like a Mickey Mouse solution. You can see it simply attached with 3 nails. Side view of the cheap plastic toe tap you shouldn't get. The cobbler used two different toe taps..not good. The flush (sunken) toe tap: nailed, screwed or glued. The next type of toe tap is flush and either glued, nailed or screwed into place. 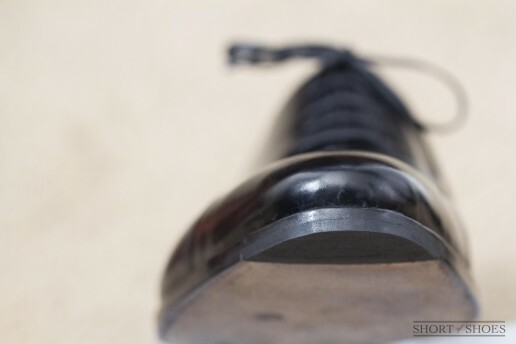 Metal is most commonly used for this type of toe tap, but rubber is used as well. It costs more, typically around $50. 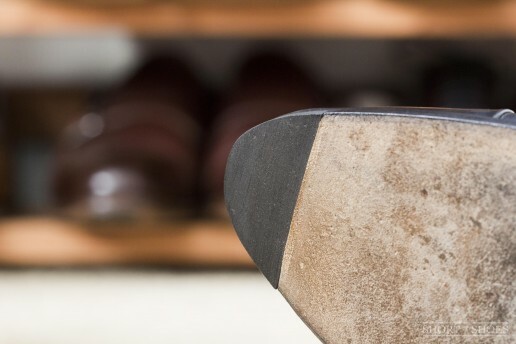 It starts with cutting, grinding and or sanding down the correct amount of leather off the toe area to allow the toe tap to sit flush with the bottom of the original leather sole. You still need to leave a few millimeters of the original leather sole so the nails/screws can drive into it or have a surface for gluing. But depending on how much leather is taken off from the sole, the cobbler will likely end up disturbing the outsole stitch. It’s especially likely if the outsole stitch is open channeled. A closed channel sole’s stitch will sit deeper, but again it's still likely to be affected if it doesn’t sit very deep into the sole which depends on how exactly the closed channel was done. 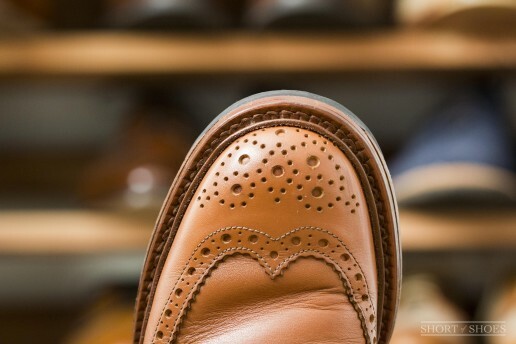 If the piece of leather sole removed includes some of the outsole stitches, then that stitch would be rendered near purposeless at the toe and it compromises the strength of the rest of the outsole stitch. 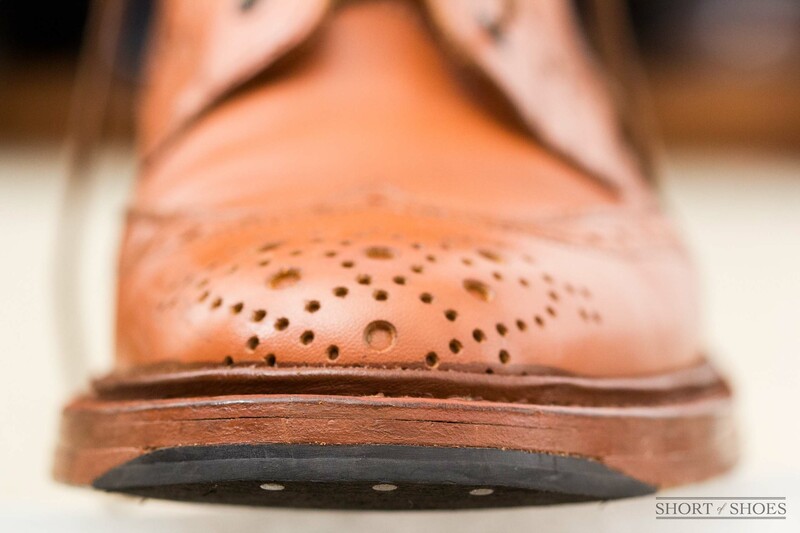 The typical lock stitched outsole could potentially unravel, granted it's not very probable. 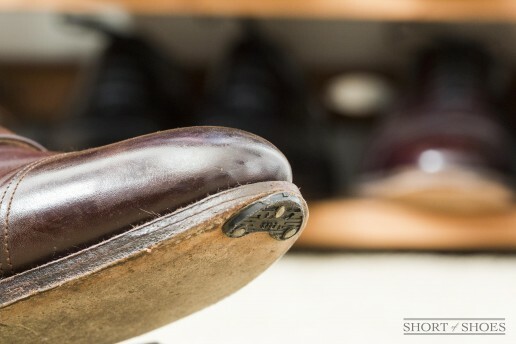 One of the main points for buying quality shoe is because the sole is stitched instead of glued which proves to be much more durable in the long run, so it's something I’d rather not want to compromise in any way. 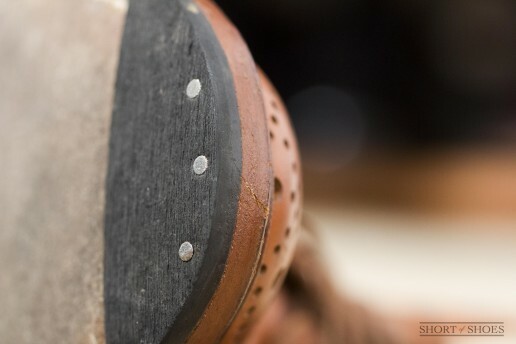 Here are several shots of my Tricker's Malton boot with a double leather sole and a glued/nailed on flush toe tap. 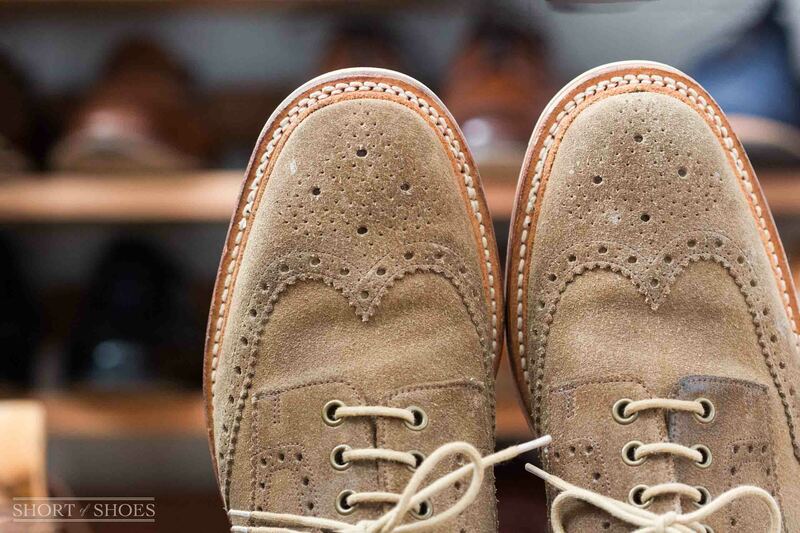 Front view on this double leather sole by Trickers. 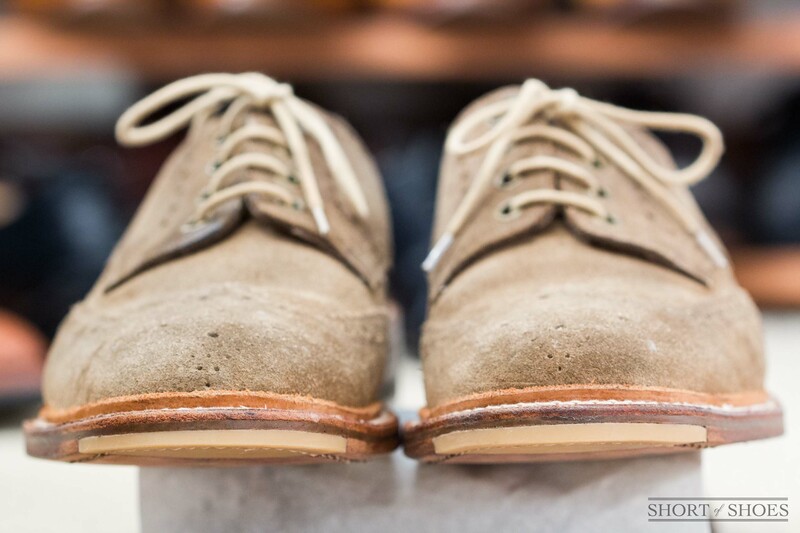 Again you run into the same issues of possibly damaging inseam stitch or insole if not done by a competent cobbler. 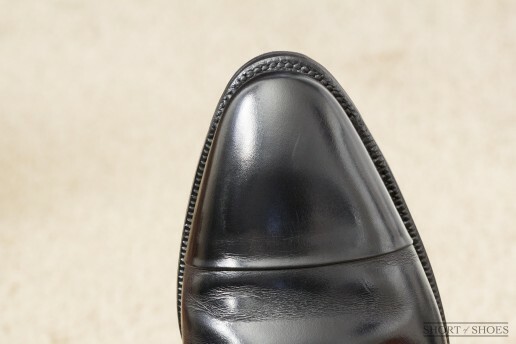 The risk is higher here since you have less leather to work with (smaller margin for error) as some of the leather sole was removed to allow for the flush fit. 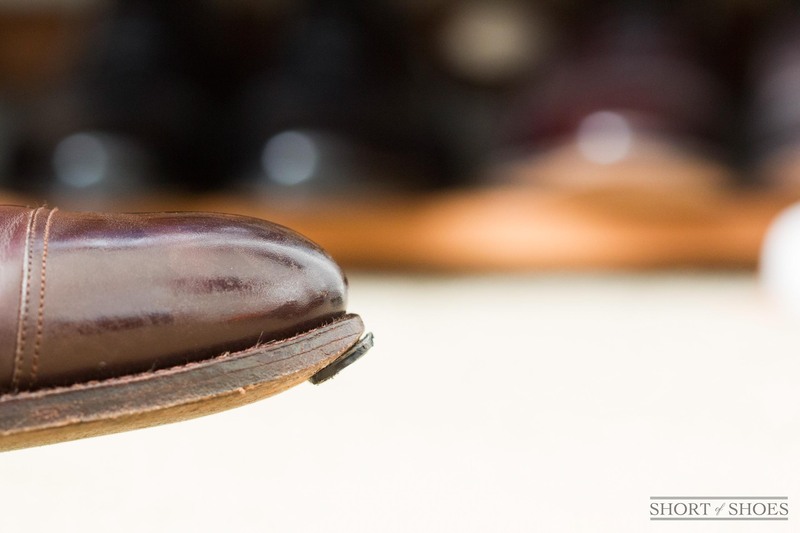 On double leather soles, it's easier to pull off correctly. 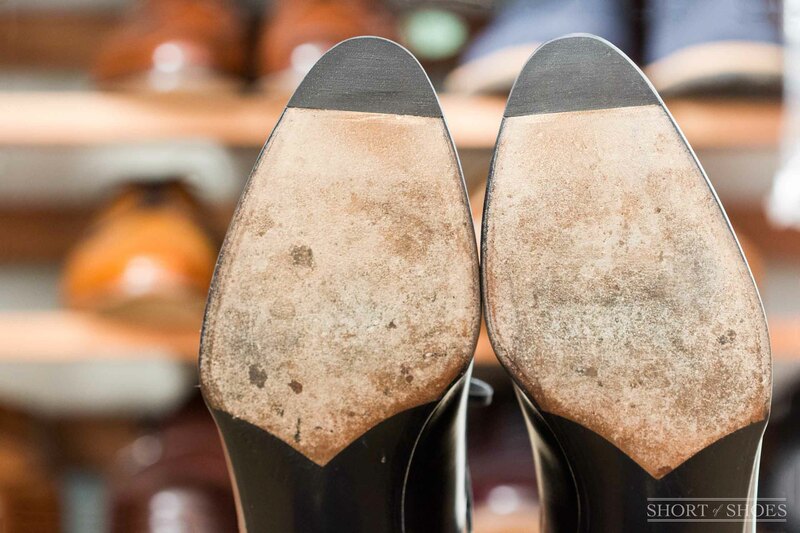 If done correctly, you don’t risk too much as far as creating permanent damage to the shoe. But a competent cobbler who can do this properly is hard to come by these days. 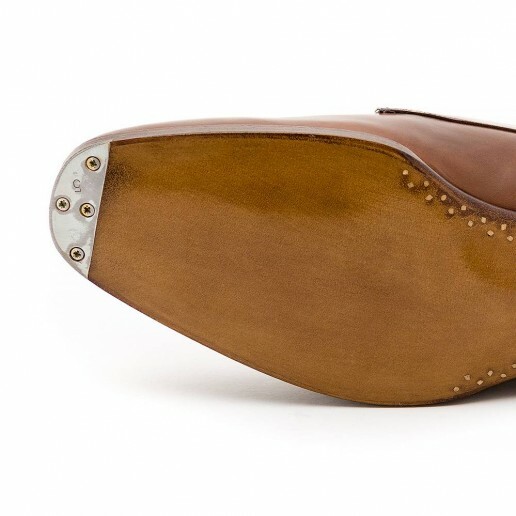 I would be confident if the manufacturer like Vass, Enzo Bonafe, Saint Crispins or other reputable makers offers this type of toe tap straight at the factory. It's a great looking toe tap, blending in very well with the lines of the shoe and sole. While definitely the better solution to the first type of protruding toe tap it has a few drawbacks. When done properly, especially from the manufacturer, it's a very good solution to preventing toe wear and prolonging the life of your leather sole. This option is likely the best option for most people. 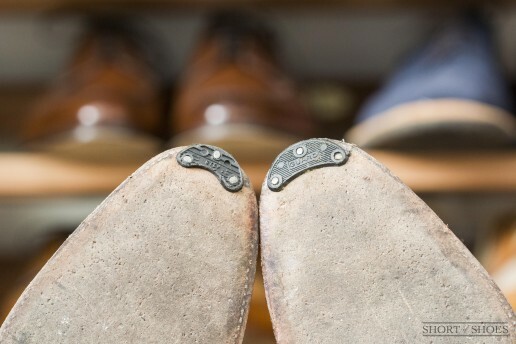 Many cobblers should be able to install these metal toe taps relatively easily. But the problem is, most don't carry this type of flush or sunken metal toe tap and is hard to find here in the United States. But I've found them for sale on eBay at the links below so you can buy them and then have it installed locally. Here's an example of a metal toe tap installed by the manufacturer. Flush rubber toe taps, done the proper way. 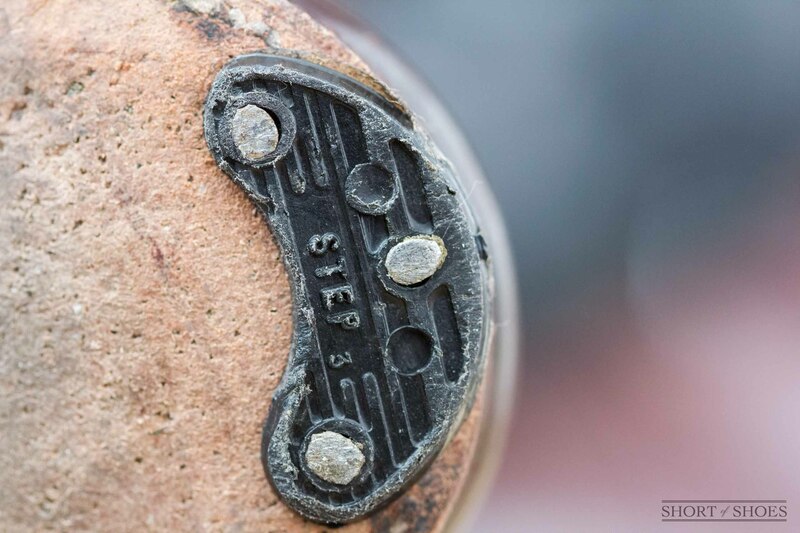 The most properly done, flush rubber toe taps start with the same process as the flush toe tap as described above. Removing a portion of leather at the toe to allow for the tap to sit flush. Now the correct way of installing the toe tap at this point is by removing the old stitches at the toe and restitching them back through the few millimeter thick piece of the original leather sole that was intentionally left for this purpose. A shoemakers or saddle stitch by hand should be used as it’s stronger than a lockstitch by machine. This isn't cheap to do, but worth it considering how much you may have paid for your shoes. So now the outsole stitching is rebuilt and not left compromised in any way. A piece of rubber is then cut and glued into place and the sides of it are sanded or cut by hand to align with the edge of the original leather sole. For a seamless transition, the cobbler may sand the side of the leather sole just slightly so the rubber is perfectly flush. 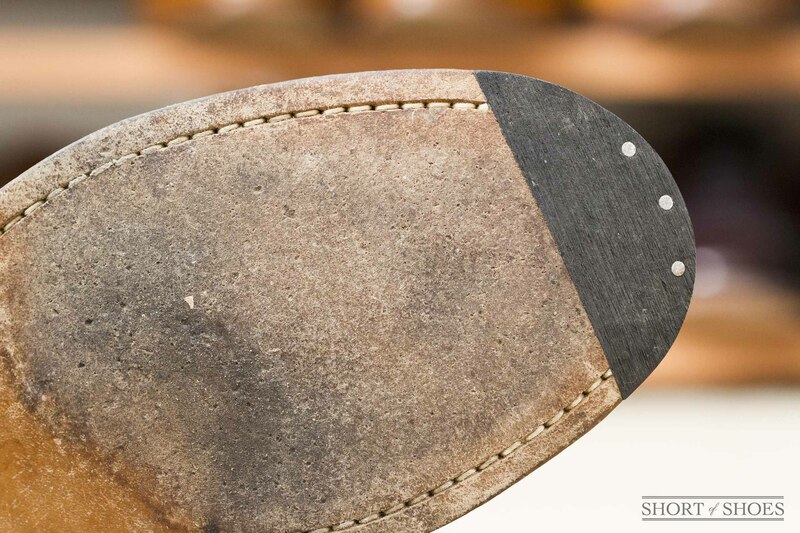 Edge dressing is then applied to the sanded area of the original sole. 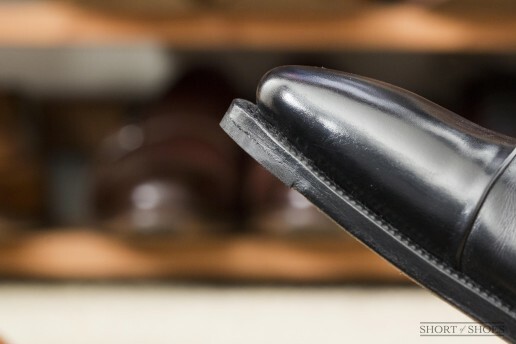 The beauty of installing the flush rubber toe tap this way is that the rubber piece can be replaced over and over again if you continue to wear the toe faster than the rest of the leather sole without compromising the integrity of the shoe’s outsole stitching. It looks great as it appears to be seamlessly built into the sole. Here are several photos of the proper flush rubber toe tap on my Enzo Bonafé Cap toes, obviously the black rubber works very well on black shoes. You can see the new stitching from this top view. 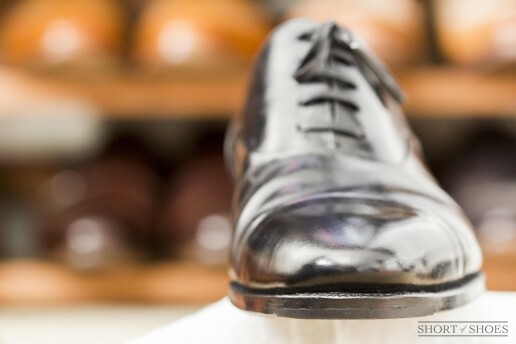 Below is a look at a pair of my Brooks Brothers by Loake with flush rubber toe taps that has stitching go through it was well. This cobbler should have removed the old stitches and used the same stitch holes, but this still works. The rubber piece isn't easily replaceable this way and doesn't look nearly as nice with the two rows of stitching on top of the welt, though. Flush rubber toe tap, glued and stitched through. 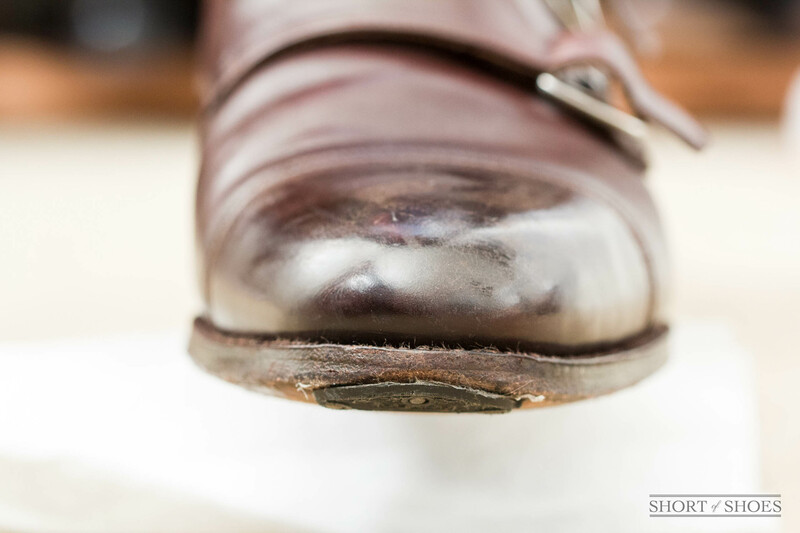 The cobbler used a much thinner thread to stitch through the welt and toe tap. You can clearly see the double stitching, they did not remove the old stitches and doesn't look good. So there you have it, three main types of toe taps: the bad, good and best. Like I’ve mentioned before, it's hard to find a good cobbler these days, even more so in the United States. 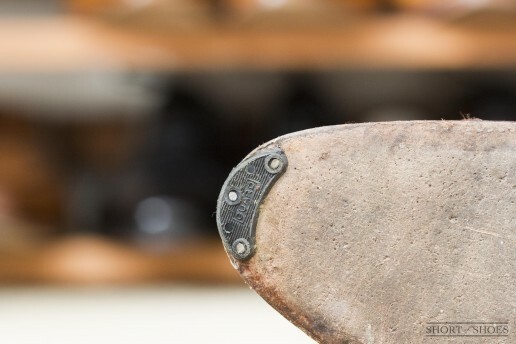 It’s best to do your research on cobblers and ask them about how exactly they do toe taps, then go with one that is familiar with doing the flush type at the very least. 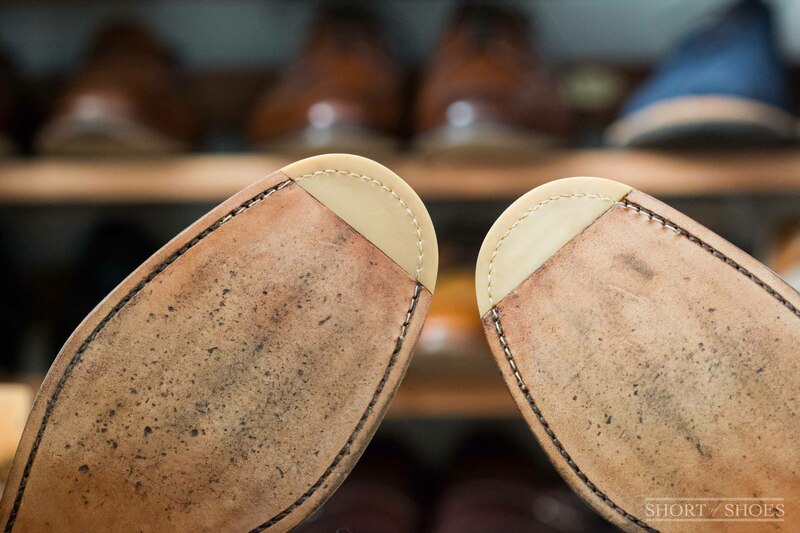 Another option would be to see if a local bespoke shoe maker also does repairs as he or she could most likely do it properly. 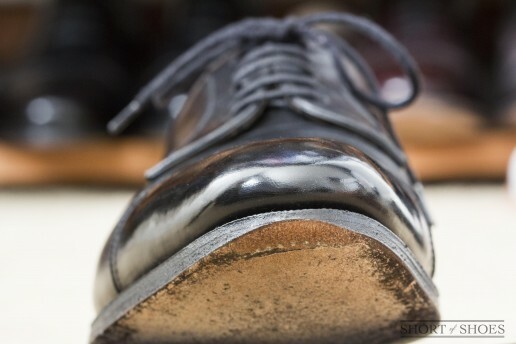 There is another option of sole protection, commonly referred to Topy or sole guards. While it's not something I prefer, I'll cover it in an upcoming article. If you’re still unable to find a cobbler to trust with your shoes, I’d highly recommend giving Willie’s Shoe Service in Los Angeles a call. You can ship your shoes to have them worked on and they are the only shop I trust with my more expensive shoes now. They aren’t cheap by any means, but they will do the job properly every time and explain to you their process step by step for any work being done. Being a bespoke shop as well, I’m sure they would be able to tackle any type of unique repair you require, at a price of course. Have any questions or suggestions for the review? Drop me a comment below after browsing the gallery!